Mr. Bernard Sylvester Pearson, 89 of Blackshear, passed away early Sunday morning, May 20, 2018 at the Hospice Satilla Hospice House. Born in Patterson, GA on October 1, 1928, he was reared in Brantley County before returning to Pierce County in the mid ‘60’s where he would remain until his passing. He was a US Navy veteran having served during the Korean Conflict and had been the owner/operator of Pearson-Dial Funeral Home for the last 52 years. He had worked in Nahunta, Jesup, Jacksonville, and then Blackshear prior to opening up Clough-Pearson Funeral Home in December of 1966. 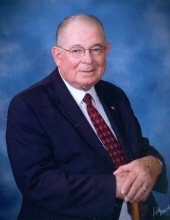 Mr. Pearson was a member of the First United Methodist Church in Blackshear where he had been in the Wesley Sunday school class. He was also a member of the Nahunta Masonic Lodge #391, an honorary member of the Blackshear Masonic Lodge # 270, and a member of the Blackshear Rotary Club. He enjoyed fishing in his younger days but his true hobby was his work. He was always smiling, loved a good joke and a good meal, enjoyed taking naps, could shell pecans and peas like no one’s business, and tried to be a friend to everyone. He will be forever missed. He was the son of the late Eldon Samuel Pearson & Sarah Elizabeth Miller Pearson Manning. He was also preceded in death by his step-father, Milton Manning; his wife, Betty Ann Johnson Treadwell Pearson; a step-sister, Virginia Bass; and a step-brother, Don Manning. Survivors include two daughters and sons-in-law, Sharon & Mark Godwin of Blackshear and Cindy & George Oberschlake of Perry, Fl; two sons and daughters-in-law, Marc & Wimberly Treadwell of Forsyth and Blake & Dee Treadwell of Blackshear; a step-sister, Vivian Allen of Hickox; 12 grandchildren, Will & Amanda Oberschlake, Ed Oberschlake, Thomas Treadwell, John Treadwell, Erica Treadwell, Alex Treadwell, Lance Treadwell, Audrey Dial, Pearson Dial, Slade Godwin, and Gannon Godwin; 2 great grandchildren Aidan Oberschlake and Kellan Oberschlake; a sister-in-law, Jean Dixon of Blackshear; and several other relatives. Funeral services for Mr. Pearson will be held Thursday morning, May 24, 2018, at 11 o’clock from the Pearson-Dial Chapel. Visitation will be held Wednesday afternoon from 4 until 7 at the funeral home. The family kindly requests for all area funeral directors and preachers to serve as honorary pallbearers. Please meet at the funeral home by 10:30. Memorials may be made to the Hospice Satilla Hospice House, 811 Beacon Street, Blackshear, GA 31516, the Southeast Cancer Unit, PO Box 2764, or to the Blackshear First United Methodist Church, PO Box 127, Blackshear, GA 31516.